The Blame for Obesity: Genes, Environment, or Ourselves? Where shall we place the blame for obesity? This question consumes an extraordinary amount of energy that could go into solving the problem. Most people assume that obesity is a personal problem of bad choices. Many other people call it a community problem caused by unhealthy food and too little opportunity to be active. In truth, the real problem is with the question. It rolls two different questions into one. The first question might be: “Why does this person have obesity?” The stock answer – because he made bad choices or lives a bad lifestyle – is simply wrong. Plenty of people make bad choices or live a bad lifestyle and never develop obesity. Plenty of people are very careful about their lifestyle choices and yet cannot shake their obesity. Overwhelmingly, a person’s individual risk of obesity is inherited. A 2008 study and commentary found “heritability estimated at 77% and a total (ie, shared and nonshared) environmental effect of <25%.” In other words, genes play the largest role in determining an individual’s body composition. The second question is: “Why is the prevalence of obesity so much higher today than it used to be?” The answer to this question is not so simple because so much remains to be learned. The environment plays a role, activating obesity in people who are genetically susceptible. Many true believers have their favorite presumptions about changes in the environment that might be most responsible for the increased prevalence of obesity. 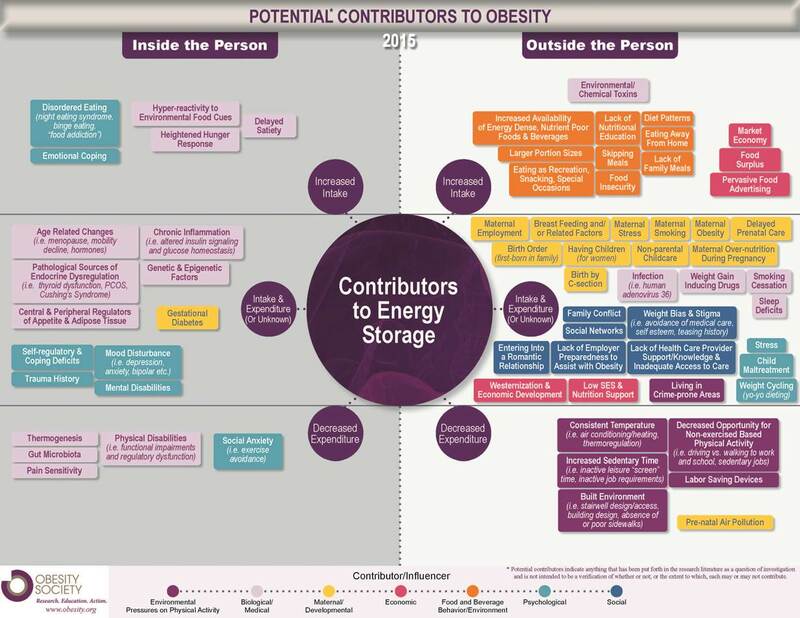 For a list of suspects, the Obesity Society’s infographic on the right is a good place to start. But the fact is that these factors are simply suspects. Any one of them may play a small role. Some of them may play a large role. Definitive proof is lacking to distinguish one from the other. Findings from epigenetic research further complicate the picture. That research tells us that environmental factors influence how genes get expressed and passed down to children. In all of what we know about obesity, one thing is simply and clearly wrong – blaming and shaming an individual for this complex, chronic disease. Click here for the 2008 study of obesity heritability by Wardle et al. Click here for the companion commentary by Solomon Musani, Stephen Erickson, and David Allison.